Chinese Sentiment Towards Blacks: Are Black Athletes the New Role Model for Chinese Youth? Like many children in America, some of my greatest heroes were athletes. Basketball players such as Michael Jordan, Scottie Pippen, and Magic Johnson were the epitome of discipline and athletic excellence. The images of these athletes were the most common and positively promulgated images of Black people I saw as a child—in my neighborhood there was not a lot of visible Black role models to look up to. So you can understand that when I first moved to China in 2002 I was ecstatic to see many Chinese obsessed with the NBA and my Black heroes. During the NBA playoffs, the university cafeteria, were I often ate lunch, were filled with ebullient Chinese students engrossed in the games. Since then, I have seen the NBA become a conduit of cultural and monetary exchange between China and the United States. However, more importantly, from a racial stand point, the Chinese media portrayal of Black basketball players, such as Michael Jordan and Kobe Bryant, as not only superior athletes, but as exemplars of mettle, compassion, and goodwill has positively influenced images and perceptions of Blacks in China. Michael Jordan was one of the earliest and most popular Black athletes accepted by Chinese society. According to the Financial Review, in a 1992 survey taken by students in China, Michael Jordan was considered the most influential person of the twentieth century, followed by Zhou Enlai—one of China’s notable political figures. After retiring, Jordan remained a very popular figure in China. During his 2004 promotional tour in China, Chinese basketball fans flocked to see Michael Jordan in person. The reaction to Jordan was so immense that Chinese police had to cancel his appearance at a Nike basketball court in Beijing for fear that it would cause social disorder. China Daily, a Chinese state-run newspapers, reported, “flower beds were destroyed and a car was damaged when enthusiastic fans stood atop it. Several billboards that blocked the fans’ view were ripped down as the time of Jordan’s expected appearance came closer”. In addition to Jordan, Kobe Bryant is another prominent Black athlete widely received by the Chinese. During the 2008 Beijing Olympic Games, Kobe’s presence overtook that of any other athlete. In addition to overwhelming chants of “Ko-be, Ko-be” during the U.S. basketball games, Kobe was also the main attraction during non-basketball events such as the soccer semifinals between Argentina and Brazil—which starred two famous soccer players Messi and Ronadinho. However, the Chinese spectators “went crazy when they spotted Bryant in the crowd”. Outside of his popularity as an athlete, the NBA and the Chinese media has marketed Kobe Bryant as a friend and a humanitarian to the Chinese. 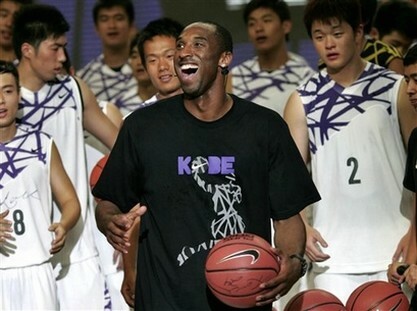 Bryant has made several high profile visits to China to conduct basketball clinics. He also starred in a documentary titled Kobe Mentu “Kobe’s Disciples” in which hundreds of Chinese youth competed for a chance to go to America to practice basketball and receive tips from Kobe. Moreover, in March of 2008, the Chinese media hailed him as a hero in for his charity towards a Sichuan earthquake victim. In the China Daily, one of China’s most read newspapers, Bryant was saintly depicted for the “generosity” he bestowed upon a 17-year-old Chinese boy who lost his legs protecting another student during the aftershocks of the Sichuan earthquake. According to the report, Li Anqiang wrote “Uncle Kobe” expressing his admiration and asking for an autographed basketball. Bryant, moved by the story, reportedly “hail[ed] Li as a strong boy whose attitude towards fate was amazing”. The article went on to say that, “he [Bryant] knew about the earthquake and hoped that all the people in the quake zone could be as strong as Li”. Of course, Bryant’s encouragement was just what was needed to inspire Li to overcome his challenges and become a studious young man. The article reported that after receiving Bryant’s letter and autographed basketball, Li was in “high spirits” and “after a hectic schedule in school, Li, who has never met a foreigner, also studies English before going to bed”. Although, it is more than likely that this story and other others like it are being manufactured by the publicity machine that is “Kobe Inc.” and the Chinese Communist Party Propaganda Department in order to better promote the Kobe brand and the NBA in China, this does not negate the effect that the larger than life media images of “Uncle Kobe”, a Black athlete who is hard working and cares about the Chinese people, has had on Chinese perceptions of Black Americans in general. This entry was posted on April 12, 2010 at 8:07 am and is filed under Uncategorized. You can subscribe via RSS 2.0 feed to this post's comments.